(ZHP/Warsaw) – Every four years delegates from all over Poland gather at the National Congress of Związek Harcerstwa Polskiego (ZHP, the National Scout Organisation in Poland) in order to decide about the most important issues concerning their association. This year’s Congress took place in Warsaw, the country’s capital city at the beginning of December. And for the first time all parts of it were live broadcast by ZHP’s own professional TV station ZHP360! 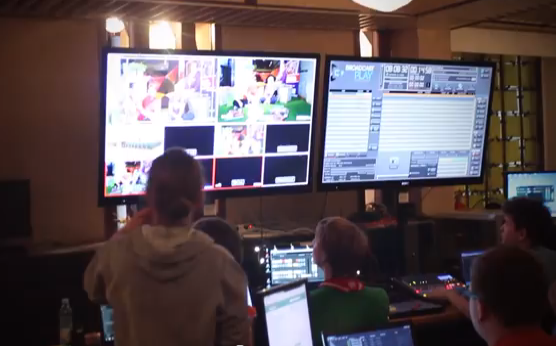 And that is exactly the reason behind ZHP360, the recently created first professional TV Station run by the Polish Scouts and Guides. “Each day, we started with a breakfast show at 8am, just like the real professionals from the Polish National TV, and for two hours our own cheerful ‘anchor girls’ made sure the audience was well informed with background stories about a variety of topics concerning ZHP. Later during the day, the live broadcast from the plenary hall began, which also included interviews with key Leaders and guests. And the programme continued throughout the day until 10pm. The busy days ended with a team meeting before everybody fell into their beds at midnight for a couple of hours of sleep.” A total of 70 hours of material were the results of the combined efforts and you can still watch them on the ZHP360’s website. So, what are the conclusions looking back on these very busy and challenging days in Warsaw?